Home / Contests • Featured / Contest Time! COMET TV and CHARGE! 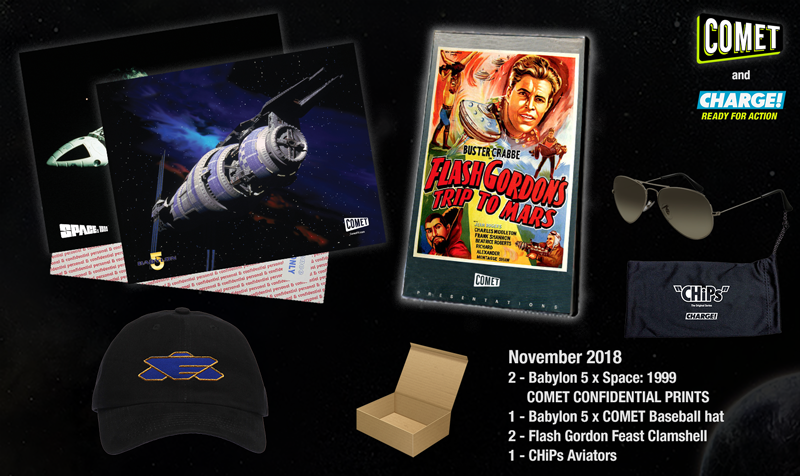 November Prize Pack! Babylon 5! Flash Gordon! Area 10 Movies! and more! November is here and COMET TV has so many awesome shows and TV Shows to entertain you! 1 – Exclusive CHARGE! CHiPs Aviator Sunglasses: How you doin’? When cursing down Pacific Coast Highway pop on these aviator sunglasses and get into the CHiPs spirit! TV Heartbeat Interview! Austin Butler and Manu Bennett talk about MTV’s Shannara Chronicles! omg its a toss up,I loved babylon 5,but night of the living dead is such a classic ! My favorite movie for the month of November that they’re airing is The Terminator. I haven’t seen that in years. It would be fun to watch again. Babylon 5 and Space 1999 are both favorites of mine and I’m glad to see them airing on Comet TV. Thank you for the chance to win. Happy holidays!